In conditions even worse than others seen at recent games, Pagham slid, skidded and slithered to a well-deserved 7-0 win over Worthing United in the SCFL premier. The writing was on the wall as Dan Simmonds scorched a shot narrowly over the bar from just outside the box after four minutes. It didn’t take long for the ball to end up in the net as Simmonds lashed the ball home from about 15 yards after an excellent cross from Shay Wiggans to put his side 1-0 up in the 14th minute. The only controversial moment came when Pagham goalie James Binfield appeared to bring a United forward down on the edge of the box. The referee disagreed and gave a corner, much to the annoyance of the visitors. 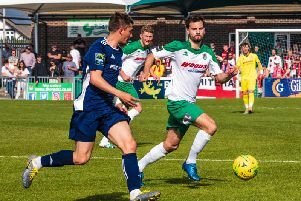 They were even more angered when, in the 17th minute, Callum Overton put the Lions two up as he slotted home after collecting a long pass and outpacing the defence. It was almost three in the 20th minute in a scramble in the United penalty area but an offside flag went up. The Lions didn’t have long to wait for a 3-0 lead when Simmonds shot home from close in after being set up beautifully by Overton in the 29th minute. Six minutes later, it was 4-0 as Simmonds completed his hat-trick, crashing home a sublime header from a James Thurgar corner. A rare Worthing attack in the 40th minute brought them their best chance, forcing Binfield into an excellent double save. It could have been five for Pagham in the last minute of the half, when a superb ball by Lloyd Rowlatt found Andy Chick. But when his shot came back off the post, United keeper Matt Evans managed to grab the ball just before the onrushing Overton could tap home. The second half started as it would continue with more attacks from the Lions. First chance of the half fell to Overton, but his long run and shot brought another fine save from Evans. On 68 minutes, Dan Simmonds grabbed his fourth and Pagham’s fifth, when he headed home from close range following a fine cross by Johan van Driel. It was 6-0 in the 70th as a 25-yard piledriver by Rowlatt took a deflection before exploding into the net. Various substitutions gave Tom Jefkins the opportunity to make an appearance on his return to the club. The scoring was completed in the 87th minute when teenage substitute Jack Parkinson scored at the far post after a fierce cross-shot by Overton came to him. With the weather deteriorating, everybody in the ground was pleased to hear the final whistle. Pagham: Binfield, Wiggans, Wollers (Parkinson), Davidson, Booker, van Driel (Ansa-McIntyre), Thurgar, Chick (Jefkins), Simmonds, Rowlatt, Overton. Subs not used: Bingham, Cox. * Tuesday’s rearranged league game at home to East Preston fell victim to a heavily-waterlogged pitch.